Dec. 17, 1923 Marion, Iowa. The club met with Mrs. Wilson. The Pres. called the meeting to order and sixteen members responded to roll call with Christmas quotations. Minutes were read and approved. The Com. 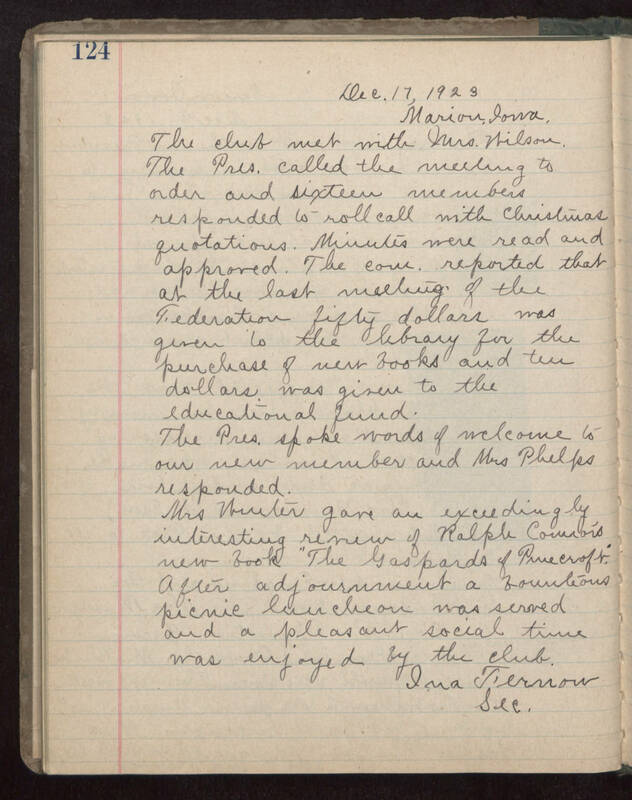 reported that at the last meeting of the Federation fifty dollars was given to the library for the purchase of new books and then dollars was given to the educational fund. The Pres. spoke words of welcome to our new member and Mrs Phelps responded. Mrs ??? gave and exceedingly interesting review of Ralph Connor's new book "The Gaspards of Pinecroft". After adjournment a bounteous picnic luncheon was served and a pleasant social time was enjoyed by the club. Ina Ternow Sec.